What man-made thing is now in heaven? The answer is the scars in Jesus’ hands, feet and side. 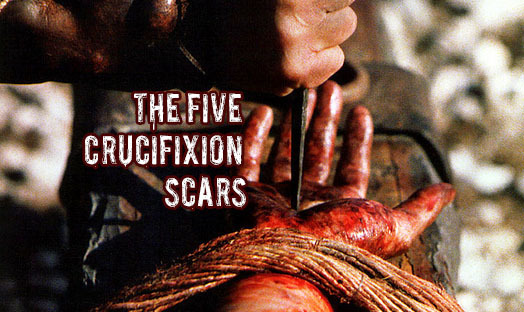 The five crucifixion scars. After they had nailed him to the cross… Matthew 27:35a. My favorite account of the Holy Week story is found in Matthew. I believe it gives us the most insight into this crazy yet beautiful and tragic story of what happened. Yet Matthew only gave eight words to the nailing of Jesus to the cross–probably because crucifixions were so common back in Matthew’s day. It was Rome’s personal choice of capital punishment for crimes of insurrection against Rome. A person could hang in agony for days for the crime thus serving as a reminder to everyone who witnessed what awaits them if they dare come against the authority of Rome. The crucifixion was designed to be public entertainment—as violent and visibly suffering that it is. Are we also entertained by violence? Should we be entertained by violence? Two thousand years later we have beautified that cross. It adorns beautiful necklaces—often given as a sentimental gift from an important person in your life. These beautified crosses mean something. It is a bright light on the building of many of our churches—lighted up for all to see that we are a church, a city on a hill, an identifier that we are Christian. Not as a symbol of capital punishment. 1 Corinthians 1:18 says The message of the cross is foolish to those who are headed for destruction! But we who are being saved know it is the very power of God. To some it is foolishness. You probably have had experiences with people who consider you foolish for you embracing the cross. But for you it is the very core of your second chance, your redemption, the possibility of your entire life. But a cross has never created scars before. Because the one hanging on the cross is not supposed to live. I have scars on my body. Scars from a hernia and hysterectomy surgeries and many laparoscopy surgeries. Scars always come out of brokenness. Something is broken and needs healing. Each of those scars tells a story of my health and how major parts of my life have been lived out. John has a 2” x 3” scar on his knee. I’m not exaggerating the size of that scar and I haven’t even told you the color of it yet. It is still purplish-red four years later. Scars are storytellers of our lives. John’s story is he wiped out on a scooter on the island of Langkawi in Malaysia. Thankfully he was only going around 10 mph. Without that detail to the story your imagination goes to worse places. Instead it is something we laugh about all the time. The scar does not equal the drama of the story but it is so visible it is a story we share often. The best people all have some kind of scar. Right?! What story do these man-made scars on Jesus’ body now sitting in full glory at the right-hand of God in heaven tell? Of a greater love than we fully understand. When we were utterly helpless, Christ came at just the right time and died for us sinners. Now, most people would not be willing to die for an upright person, though someone might perhaps be willing to die for a person who is especially good. But God showed his great love for us by sending Christ to die for us while we were still sinners. And since we have been made right in God’s sight by the blood of Christ, he will certainly save us from God’s condemnation. Romans 5:6-9. Love and execution. What a strange pairing. God defines love as a pursuing force that is not dependent upon your response back. God is going to continue to pursue and love anyway because he is love. This is the story of his scars. Scars always come out of brokenness, something is broken and needs healing. These five crucifixion scars are my healing. This first scar was God’s pursuit of me. I am forever grateful. It is a gratefulness I try to remember often. "Pain is beautiful when it helps you grow beyond pain, fear, and yourself." “Pain is beautiful when it helps you grow beyond pain, fear, and yourself.” | Bravester on Feel Your Pain. Dance in the Rain.